CC Tillery is the pseudonym of two sisters, both authors who came together to write the story of their great-aunt Bessie Daniels Elliott in the Appalachian Journey series and once that was concluded continued writing Appalachian historical fiction with the Brown Mountain Lights series. Tillery is their maiden name and the C’s stand for their first initials. 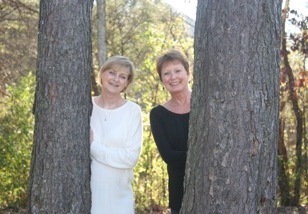 One C is Cyndi Tillery Hodges (on the left), a multi-published author who writes under the pseudonym of Caitlyn Hunter. She is the author of the Eternal Shadows series and Winds of Fate, all paranormal romances based on Cherokee legends. She has also written several contemporary romance short stories and two fantasy novellas. The other C is Christy Tillery French (on the right). Christy is a multi-published, award winning writer whose books cross genres including romantic suspense, psychological suspense and dystopia. She is the author of The Bodyguard series and five stand-alone suspense novels. What are the titles of the other books after Whistling Woman? I would like to read the other books to see what goes on in their lives. I enjoyed Whistling Woman. I have the same question. What’s the title of the next book in the series? I want to continue reading about Bessie’s life. Yes, our whole book club would like to know the title of the sequel. Hi, all! Sorry, I didn’t know your comments were here until I received a notice from WordPress this morning about Barbara’s comment. The name of the next book is Moonfixer and we hope to have it out in early December. As for the book after that, we don’t have a title yet but we do have a tentative outline…but that will have to wait until after we finish Moonfixer. Thanks so much for letting us know how you liked Whistling Woman and for your interest in Moonfixer. As soon as it goes live, we’ll post about it here and on the Whistling Woman Facebook page! Just finished Whistling woman last night. Can not wait to find out what happens in the next on. Thanks, Wendy. We hope you enjoy Moonfixer, too! I’ve read Whistling Woman and Moonfixer. When is the next one due out? Hi, Shelley. We’re hoping to release the third book in the series, Charming Gardeners Beloved Woman, later this year. We’ll announce it here as soon as it’s available! Thanks for your interest! What about “Charming Gardners?” I thought that was the next in the series. Have read the two previous books and loved them. Can hardly wait to continue, but can’t find the 3rd book anywhere. Hi Sherrie. Christy and I are so glad you liked the first two books, Whistling Woman and Moonfixer. I’m sorry to have to tell you Charming Gardeners hasn’t been released yet. We’re hoping for later this year and will post it here–in case you can’t hear us celebrating! Take care and thanks for commenting. Thanks so much, Sue. We’re currently working on the next book and hope to have it available on Kindle late this year. We appreciate your interest! I love these two books. My father’s family is from the mountains in North Carolina. He used to take us for walks in the woods when we were little. He would tell us stories and hunt for arrow heads. I can’t wait for the next book. Thank you so much. Thank you so much, Melinda. Sounds like you had a childhood similar to ours–walks in the woods up the mountain, stories, and I remember searching for arrowheads, too. I always wiished that we lived there in the mountains instead of only visiting it a couple times a year! Thanks again for your lovely comment! I loved both Whisling Woman and Moonfixer. I hope Charming Gardeners comes out soon. I’m excited to return to the mountain!! Hi, Arland. What a great comment–thanks! Charming Gardeners underwent a title change a couple of months ago. It is now titled Beloved Woman and should be out by the end of this year. We’ll announce it here and on our Facebook page. Thanks again, we love hearing from readers like you! I just read all three books; Whistling Woman, Moonfixer, and Beloved Woman. I have thoroughly enjoyed them all. I can’t wait for fourth book; Wise Woman. Thanks so much, Dee! We’re thrilled you enjoyed the fist three books in the series and hope you like the fourth one when it comes out! When is the Wise Woman being released? Hi, Terri. Unfortunately we don’t have a release date yet but we’ll be sure to post it here when it’s available. Thanks for commenting and for your interest! i love these books,i live in nc.and have been to ashville and old fort numerous times.when is wise woman comming out?i cant hardly wait. Hi, Patricia, and thank you for your lovely comment. We are working on Wise Woman but unfortunately, don’t have a release date yet. We’ll post it here when we do! Don’t you love living in NC? I know I do! Thanks again for your comment! I began reading Whistling Woman a few days ago and just finished Beloved Woman. LOVED, LOVED, LOVED the books. They just grab you and won’t let go. Can’t wait for Wise Woman. The Cherokee legends interspersed throughout the books were so interesting. Thank you, ladies, for sharing your family’s “journey”. You’re welcome, Alice and thanks so much for your lovely comments about the books. We’ve enjoyed most of the research we’ve done for this series, but the Cherokee legends are a favorite! Thanks again for your wonderful comment–our readers are our chief source of inspiration for writing Great-aunt Bessie’s story! Waiting for “Wise Woman” book 4…..love all this series. Can’t wait for another. Thank you so much, JF. We’ll post here and on our Facebook page when Wise Woman is available. We appreciate your interest and love that you’re enjoying the books! Just love the three books out, read them very fast just couldn’t put them down. Anxiously waiting for the fourth one. Thanks so much, Jackie! We are currently working on Wise Woman and will announce it here and on our Facebook page when it’s released. So glad you’re enjoying the books! Just finished Beloved Woman. Read all 3 in a matter of days and can’t wait for the next one. Best series I have read in a long time. Could not put the books down. Thank you!! Thank you so much, Jo! We’re glad you’re enjoying the series and hope you like Wise Woman when it comes out! Add me to the list of very happy fans, anxious to read your next books. Thank you very much for sharing your family history with all of us. Peace to you as you continue your work. Thanks, Sue, for your lovely comment! We’re so glad you enjoyed the books and hope you like Wise Woman when it comes out. Christy and I never knew we didn’t want these stories to be lost forever and since our dad wouldn’t write them down or record them, we decided to write them ourselves! Aunt Bessie and Uncle Fletcher were amazing people who lived an amazing life! Thanks again! Thanks again, you really made our day! Will there only be 3 books in this series? I have them all 3 downloaded on my Kindle but want to be sure I have them all before reading them! Hi Maria. Sorry for the late response. We are currently working on the 4th book in the series, Wise Woman and hope to release it in December. We’ll announce it here and on our Facebook page. Stay tuned! Hi Christi and Cyndi! Super job on the books!!! I am awaiting your book 4! Thanks so much, Susi! We just released Wise Woman yesterday on Kindle! Print book should be available next month. Just finished the fourth and last book–I am sad that I have come to the end of the story!! I researched each of the locations mentioned in the story, but could find no reference to Stone Mountain. Was this a ficticious name you gave to the location? I did however find Black Mountain. Finally, what happened to the 400 acre farm? Does your family still own it? Hi, Belinda, and thank you so much for contacting us with your thoughts. Stone Mountain is actually Black Mountain, although was known as Stone Mountain when Bessie moved there with Fletcher. From what I understand, Bessie and Fletch sold the farm to the state and in exchange were granted the right to live on it until their deaths, after which time it was sold. It’s a beautiful piece of property and we visit from time to time. I really wish it could have stayed in the family. I have not finished reading Wise Woman yet on my Kindle. I wanted you to know how much I have enjoyed this series with Bessie and Fletcher. What s wonderful heritage your family had. I hope to read more books with your collaboration. Keep up the good writing. Thank you so much, Sue, for contacting us with your thoughts. So glad you have enjoyed the series and we appreciate so very much your interest in our future endeavors. We are truly blessed to have such inspiring readers as you! I just finished your 4th book. Thank you both so much for those wonderful stories. I absolutely enjoyed each one. Thanks so much, Sheila, for contacting us and letting us know your thoughts on the series. So glad you enjoyed each book and we appreciate more than we can say your kind, inspiring comments. I just finished all four books and Im sad their over. I couldnt put them down. Thank you so much for sharing your families history. You’re welcome, Jodi and thanks so much for letting us know what you thought about the books. Your lovely words mean more to us than we could ever say. Hi, Kathryn. First, thanks for recommending our books. We really appreciate it! Second, we’d love to come to Hot Springs to meet you and your book club. Just let us know when and we’ll do our best to be there. My email address is cthodges0721@aol.com. I look forward to hearing from you. Hello! Can you tell me when Book 2 in the Mountain Lights series will be coming out? Hi, hackwing, and thanks for your interest in our books. We are currently working on Book 2 of the Brown Mountain Lights series and hope to release it later this year. We will, of course, announce it here and on our CC Tillery Facebook page so stay tuned! Hackwing, I apologize if we’ve answered before but WordPress has erased a lot of our replies. We just released the ebook of Seeking the Brown Mountain Lights, and plan to release the paperback within the month. Thank you so much for your interest, which is so inspiring to us. I am such a fan. I read the series starting with Whistling Woman and turned my daughter in to it as well. I love The Brown Mountain Lights. Keep up the great work! Thanks so much, Sharon! And thanks for recommending the books to your daughter. I’ve said it before and I’ll say it again: we have the best readers ever! Sharon, I apologize if you haven’t received a response from us but WordPress hasn’t been alerting us to emails received. Thank you so much for your kind comments. We are so blessed to have readers like you who are so inspiring to us. I wanted to let you know that we just released the ebook version of the 2nd book in our Brown Mountain Lights series, in case you’re interested. We plan to release the paperback within the month. We cannot thank you enough for sharing your thoughts about our books with your daughter. You’re the best! Thoroughly enjoyed Whistling Woman Series, and Through the Brown Mountain Lights, which left me hanging! When can we expect sequel? Thanks a bunch, Audrey! We are currently working on the second book of the Brown Mountain Lights series and hope to have it out later this year. We’ll announce it here and on our CC Tillery Facebook page so stay tuned! Hi, Audrey. I am sorry if we didn’t respond to you. Our WordPress has gone a bit wacky on us! Thank you so much for your kind comments. We just released the ebook version of Seeking the Brown Mountain Lights on Amazon if you’re interested. The paperback should be released within the month. We can’t thank you enough for being so inspiring to us. Hello. Just want to tell you how much I enjoy reading your great books. I’ve read all of them. I can’t wait for The Brown Mountain Lights Book 3 to come out. Can’t wait to find out what’s going on. Such a great series. Can you shed any light on this series? Thank You. Thanks so much, Marilyn, We’re so happy you enjoy the books. We are currently working on book 3 of the Brown Mountain Lights series and hope to release it later this year. We are so blessed to have readers like you that keep us inspired! Met you yesterday at the Doughnut Festival. I hope I see you in Old Fort at the Pioneer Days. Thanks so much, Rita! We’re looking forward to see you again. We’re so blessed to have readers like you and we always enjoy talking to them! Hi, Rita. We really enjoyed meeting you. Yes, we’ll be in Old Fort at Pioneer Day. See you there!